Greenhouses and Their Humanizing Systems, coauthored with Sandra Haeuplik-Meusburger, Daniel Schubert and Paul Zabel (peer-reviewed journal of astronautics: Acta Astronautica, March/April 2014) available here. left: Expedition 5 cosmonaut Victor Savinykh with plants on Salyut 6 (image credit: Spacefacts, J. Becker). Edited by Matt Bua and Max Goldfarb (Laurence King Publishing, 2013). Included are working and mechanical drawings for my collapsing elevator, PEGLEG: Up for War, a memorial to Space Shuttle Columbia (2004-2008). "DIVER" PROFFERS SCANT remnants of Paul Thek's massive, often-collaborative and ephemeral installations. The retrospective conjoins these remains with rarely seen paintings, small objects and notebooks to create a very different picture of Thek than the vaunted, mythological "artist's artist" legendary to many. With pleasure we read Thek by Thek, finally. A revelatory way to see the exhibition is to walk through it backward chronologically — "against interpretation" — as may have been advised by Thek's friend Susan Sontag, who dedicated her seminal book of essays with the same title to him in 1966. Starting in the extant gallery — almost an afterthought to the main exhibition space — viewers encounter humble paintings from Thek's last show hung low on the wall. While he lay dying of complications from AIDS in the summer of 1988, none of the works sold. Time is a River and Dust (both 1988) — only two examples of many in the room — carry a bright turquoise hue as resonant theme. Across the color appears Thek's poetry imbued with a reflected light like sun glinting off the water. While there is time (1987), Thek painted the year before, "let's go out and / and feel everything." Paul Thek loved the sensuality of the world but had monastic longings. A Roman Catholic, he was devoutly interested in materiality at its vanishing point — death. His journals are filled with a crux of observations and poetical indulgences at the point where spirit meets body meets humanity, the eye of the world. A show of Thek's multitudinous private notebooks alone could have carried the day. Paul Thek, Untitled (Earth Drawing I) ca. 1974. Estate of George Paul Thek Courtesy Alexander and Bonin, New York. Other simple objects with this power include Untitled (globe) (1973), a glass orb painted like Earth sitting in a nest, and Portable Ocean (1969), a construction of a child's wooden wagon with blocks painted in atmospheres. As Thek and Sontag may have concurred, materiality is just a state of potential that art and hermeneutics release. Thek's icy clouds protect softer viscera. Only seen upon crossing the next threshold on this backward trajectory are the installation and meat works visible — this is the raw Thek who is everyone's favorite, the one with balls. Refreshingly we learn that Thek was not just that artist. In fact he "suicided" his most famous work The Tomb (1967), which featured a naked, full-body replica of himself in a pink ziggurat — dead — by refusing its shipment back to him in New York in the early '80s. Weighing in on the side of life, not art, he is said to have rebelled when asked to show it: "Not that piece again! Imagine having to bury yourself over and over." In the next room, Thek's mid-'60s series Technological Reliquaries are a perversion of Smithson, Judd and Minimalism in general, encasing theatrics and horror. Thek's prosthetic incursions into pure geometric space demonstrate that the voice of the artist emerged from deep within the body. "We accept our thingness intellectually but the emotional acceptance of it can be a joy," wrote a young Thek upon his visit to the Capuchin catacombs with his lover Peter Hujar, photographer for much of Thek's studio ephemera on display. Stepping out of the meat room at last into the entry vestibule, a huge projection of Warhol's Screen Test: Paul Thek [St337] (1964) shows a clean-shaven Thek blinking calmly as he is considered for a series of "the thirteen most beautiful boys." Starting here the completely misleading image would make a spectacle of the exhibition. Unspeaking, vacuous, Thek is captured in a permanently undead state of pubescent beauty, the decay he loved, nowhere to be seen. Leaving "Diver" on this note, released back into the flow of time, it is clear Thek chose the hardest path — to document his own life as it passed before his eyes. “Twelve Miles to the Horizon,” Catherine Opie’s recent exhibition at Regen Projects, needs to be examined in terms of its installation in order to access the significance of the project. Twenty-two vertical photographs charting Opie’s ten-day trip aboard a cargo ship focus the viewer in the center of a tranquil and transcendent space, and between two destinations: the Port of Busan, South Korea and the Port of Long Beach, fore and aft in the room. The narrative of the shipping container, personified by Opie’s lens fixed on the horizon, seems to be an avatar for Opie herself, carrying a history of journey into and over the sea from past photographic series. The echoes of The Alaska Series and her portraits of surfers out in the mist can be felt immediately in the room. Like ghosts of her own past, Opie’s photographs here continue to empty and carry meaning through a refined and ephemeral semiotics where the stark and uninhabited landscape is a mirror for the autobiographical project of her life’s work. Installation view of "Twelve Miles to the Horizon"
In “Twelve Miles to the Horizon” distance is gauged in terms of the height of her lens, always pointed toward the setting or rising sun, starboard and port sides of the gallery. The viewer inhabits the same space as the cargo container, and the carrying ship, and the capturing device of this ephemeral passage of capital, Opie’s camera. We bear a burden, along with her, of this connection via cargo between people and places based on a consumer/producer relationship. That space of viewing, the empty gallery, is both an emptiness where thought can occur, and a consumer space, where the whole world has been turned inside out by art, and the twelve miles to the horizon can become as thin as the photograph. Is it even possible to apply a Cartesian system of mapping to a self that leaves one place in search of another port of entry? This ultimately existential question is measured by time, Opie’s portraiture subject here, who sits for her at the beginning and end of every day on the voyage. In each vertical image, the sun, center frame, becomes a tunnel where the eye goes through, to see something internal. Busan is the world’s fifth busiest port, the second-largest city in South Korea, and the home to the upstart Busan Biennial. Opie’s journey then also suggests a possible route for art to travel; her subject, tracing a line over an unimaginable deep, is a possible reference when others undoubtedly follow her. But the photographs also work backward, in retrospect and homage. Opie’s images strike resonance with American photographer Minor White, whose setting sun on the horizon off the unstable coastal promontory near Half-Moon Bay from 1947 Pacifc, Devil’s Slide, California is similar in effect. White is quoted as saying: “No matter how slow the film, Spirit always stands still long enough for the photographer it has chosen.” How much Opie has surrendered herself in order to take these images of the quiet place between life and death, shipping and receiving, is something you have only to stand in the middle of her work to know. “Multiverse” at Claremont Museum of Art is rife with humor and homespun social histories. For example, Jedediah Caesar’s resin blocks are cut into analytical cross sections that reveal the detritus of his studio-verse, and Kerry Tribe’s low-tech ambient effects film made with the kitschy “Lumia Ori” (circa 1980), which simulates the Northern Lights and was a fixture in her parents’ fireplace. Other works in the show suggest the Multiverse has political dimensions: Nancy Macko’s video “Bee Stories” is a kaleidoscopic wormhole into the matriarchal culture of hive structures and human languages, proposing the importance of communication as a tool for re-making the world. Emre Hüner’s captivating animation “Panoptikon” is complex, rich, and dense with impossibilities; true to its Foucaultian title the apocalyptic multi-narrative suggests the singular prison of the imagination – one that has no boundaries, only vision. Art is a universe unto itself - deliciously expansive - as shown by Fred Tomaselli’s deep photograms and Sebastiaan Bremer’s pointillist fractal over-paintings on cosmic colored Cprints. 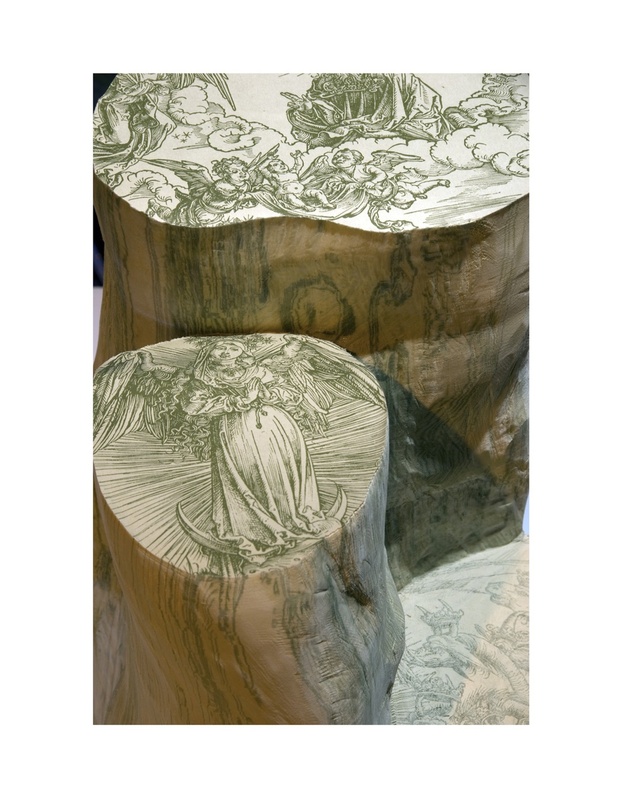 In a flip-book sculpture that stops time itself, Miler Lagos has taken copies of Albrecht Dürer’s etching of The woman clothed with the sun, and the seven-headed dragon from The Book of Revelations, made into a stack of multiples and carved the mass of paper into a stump. The end, you see, is the beginning. Hate You, We’re Happy – The Dark Side of Survival” suggest the root cause of these fires is nothing as disorganized or organic as a riot, or as singularly preconceived as arson; it’s a spark from the metaphorical powder keg. The smoke emanates blackness, and will soon envelop the city. The mood of the nation pre-election seems to rise upward on Simmons’ chalkboard-black canvases into an expansive sky. Derrida would have appreciated this portrait of hope under erasure.